An afternoon of possibility, empowerment, and discovery. Health, harmony and well-being are already within you; seek no further...you are the solution. I believe peace in our lives is not only possible, but inevitable when we change the way we see food. I know beyond all doubt, that good health is our birthright...but only when we stop giving our power away and instead, turn inward. 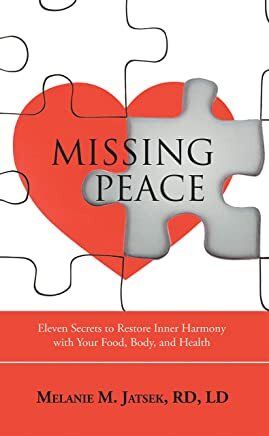 Please join me in celebrating the birth of Missing Peace: Eleven Secrets to Restore Inner Harmony with Your Food, Body, and Health. An uplifting and empowering presentation by Melanie on four of the core Missing Peaces. Expert guidance on what to eat to rock your health. Tools to unleash your true power to: make better food choices; activate positive food cravings; sidestep overeating and emotional eating. An exercise in guilt-free eating (food will no longer control you!). Delicious Earthfood-rich food samples and recipes. A live cooking demo of a quick, nutritious, and tasty meal by Laura Campbell, chef from the Culinary Institute of America (plus you'll get to taste it!). Raffle drawing giveaways, including an opportunity to win one of several copies of my new book, Missing Peace ...plus other valuable treasures. You will leave this intimate gathering with renewed excitement over the possibilities that lie ahead, for you will be in possession of the key to unlock your food prison cell. Please click HERE for a map of where to park at Kalman & Pabst!